How does a returning missionary make a successful transition into the next phase of their life? This is a question many are asking - as their children are finishing up full-time service and beginning new chapters in their continued growth and development. 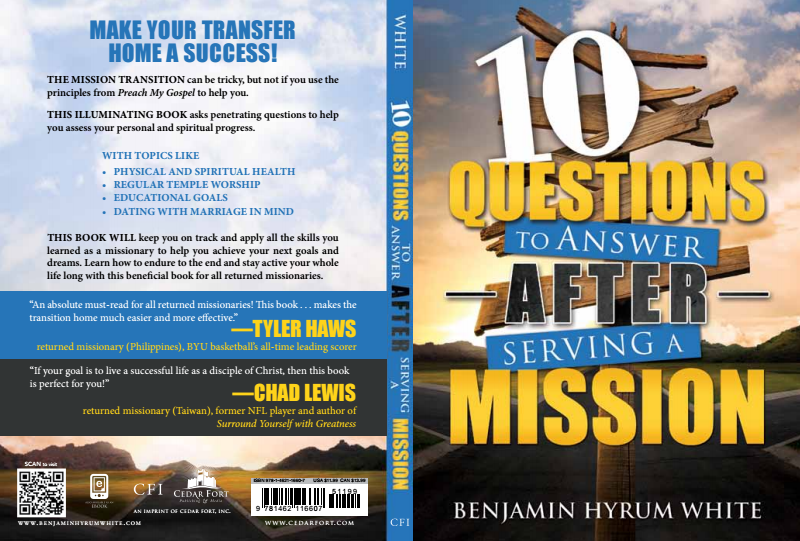 Benjamin White, Seminary Teacher, Education Week Presenter, Father, Neighbor, Friend, answers this in his new book "10 Questions to Answer After Serving a Mission." I wish we'd had this 9 months ago when my daughter returned from the Virginia, Chesapeake Mission - as it would have been very helpful. But, I'm grateful we have it now - as the principles still apply and it will also be very beneficial for my son who will be returning home next year. assess their commitment to the Lord. that will extend into the eternities. 10 Questions to Answer While Preparing for a Mission. We have come to love and trust Brother White and know that he was inspired to compile this information for so many who are in need during these changing times. These basic truths will help keep them on the correct path of activity and happiness. We are grateful for all his efforts - in behalf of the rest of us - to teach, instruct, and inspire. to help you live the gospel everyday. whole life long with this must read book for all returned missionaries. Or....find on the Benjamin Hyrum White Website.